The first Western Australian farm to grow & pack on the same site, we continue to lead with our progressive technologies. 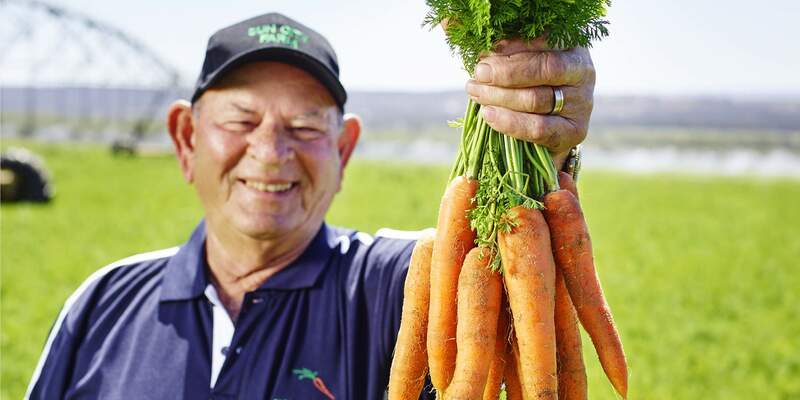 After starting to export carrots and other produce from a much smaller property in 1981, Frank Tedesco started Sun City Farms and Center West Exports in 1989. Since then, the farms and the business have grown steadily and carefully into over 1,300 acres of fertile, productive farmland. In 2003, the two businesses came together to form a single entity and become a major premium producer in the carrot and fresh produce production and export sector. The new facilities built on the farm in 2003, comprised of an up to date packing facility, administrative offices and farm buildings. Center West Exports then became the first Western Australian farm to grow and pack on the same site, giving them complete control of the product from seed to shipment. Carrots are harvested, hydro-cooled, graded, packed and in the cool room ready for export within 45 minutes. Due to growing demand, these premises were upgraded to increase capacity to 200 tonnes per day. In 2008 a further upgrade was done to include advanced technology and automation to the business. The changes focused on increasing the speed of production to maintain the highest levels of freshness and deliver produce as quickly and efficiently as possible to our clients. Today, the owners and team at Sun City Farms/Center West Exports are still highly motivated and looking at further expansion and ongoing evolutions in production. Adding more land, accessing more fresh water and employing the latest technologies to upgrade our farming, production, processing and delivery systems. Overseas visitors and prospective clients are always welcome to call at the farm, see our production operation and meet our hardworking team.